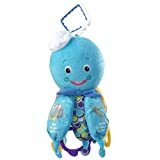 I love the ocean and was excited to get an ocean themed toy for my baby. However… no wonder kids these days have ADD! The music/sounds are soooo freaking short! The ocean/bubbles sound lasts ONLY 1 second, then there are 2 songs that lasts ONLY 10 seconds each. You pull, hear the bubbles sound, pull again for song #1, pull again for the bubbles, then pull again for song #2… that’s a lot of freaking pulling in only 22 seconds! I am NOT exaggerating… I timed the sounds. I would have returned it had I not torn off the packaging in my haste and excitement. Toy looks cute but dang… it was made for kids with super short attention spans! We introduced Mr. Octopus (we call him that too!) to our son around 3 months and he just loved this toy. He couldn’t grab yet but we would crinkle the tentacles and play the music for him. Now that he is 6 months, we can’t go anywhere without this toy! He can now grab the tentacles and crinkle and chew on them as much as he wants. He chews on all the rings and snuggles with it in his car seat and the music does (most of the time) stop the bored tears. So far, I’ve just been spot cleaning it but does anyone know if there’s a more thorough way to clean the whole body? He gets dropped/thrown on various floors a lot (restaurants) so I take it into the bathroom and dab it with paper towels but I’d just like a more thorough cleaning when we get home. It’s soft, no hard edges and I feel safe letting him play with it while I do something else. We call him Mr. Octopus or Old Blue:) We bought this toy for our daughter when she was just 3 months old, and she has loved it from the instant we showed it to her. She’s now 8 months and continues to love this toy. Her whole face lights up when we get him out, or show him to her. She really likes the music and water sounds. She likes to chew on the crinkly legs, or the little rings and chewie that he has attached to him. He’s soft and washes off easily. It’s a good sized toy also, she can hang on to him and he’s not too heavy or awkward. I would buy him again in a heartbeat!